We took it pretty easy today and spent more time talking than riding. It was a fun day though! 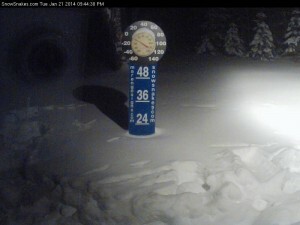 All trails are still in great shape but are a little on the loose side (due to the recent foot of snow that fell). We stopped at the Bergland Bay Bar for their famous beef sandwiches, then hit Bam Bam’s (in Marenisco) on our way back. Trail 1 from Presque Isle north had plenty of snow, a few bumps from the weekend traffic. Lake Gogebic is in great shape, plenty of snow and smooth. WARNING – trail 11 from Winchester to the U.P. is closed. As you can see on the map below, we rode over there, saw the sign and turned around! 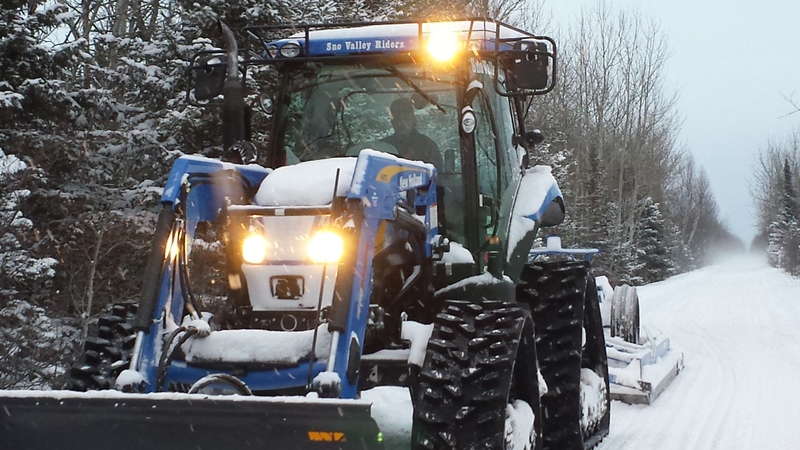 Be sure to LIKE our facebook page if you’d like to follow our trail reports, snow gauge and photos! We got a late start this morning and thought the trails might be a little beat up, but we were wrong! If you look at the map below you can see we hit lake Gogebic, Trail 8 East to Kenton, Trail 107 South to Watersmeet and then trail 2 West to Marenisco. 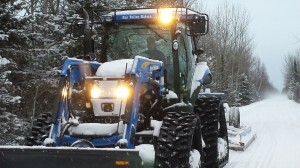 Throughout the day we saw 3 or 4 different groomers and enjoyed a very smooth ride. The only “chop” we saw all day was near the trail 13 and trail 2 intersection headed East. That’s typical for that area though (high traffic). 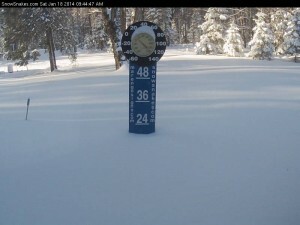 Lake Gogebic has 12+ inches of fresh powder on it and everywhere else picked up AT LEAST 6″ including the northern Vilas County (Wisconsin) trails. We rolled out of our place at 10am. Got gas and grabbed breakfast. 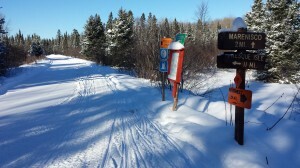 We cut the first tracks on trail 6 into Presque Isle then took trail 1 north. We saw a bunch of sleds while eating breakfast, but most of them must have stayed in Wisconsin. On our way up trail 1 we saw 3 or 4 sleds tops. After passing Marenisco we passed the groomer and things were excellent. 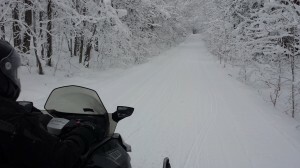 The roughest part of the day was riding lake Gogebic between Gogebic Lodge and Fish Tales. Since we were a ways from shore there were snow drifts that had melted and refroze. Each time you hit one was like hitting a rock and it tried to buck you off. After we got past Fish Tales it smoothed out and we were on our way. We made a quick stop at the Ski-doo dealer then gassed up and headed to Rockland to grab “half a heifer” (a sandwich on their menu). The ride was unreal, trail 13 was smooth the entire way and the scenery was perfect. After we ate we took the same route back. The visibility dropped a bunch due to blowing snow, so we took our time. It was much colder on the trip home, around -20 without the windchill. We decided to stop at Bam Bam’s in Marenisco to warm up. After that stop we rode the last 20 miles into WI and made it home. 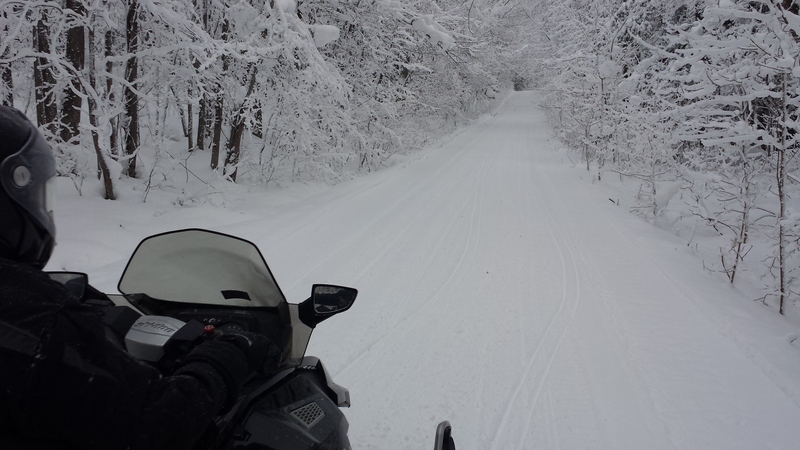 You are currently browsing the Snowmobile Trail Conditions blog archives for January, 2014.